Abstract: The microfacies and biostratigraphy of components in mass-flow deposits from the Lower Cretaceous Rossfeld Formation of the Northern Calcareous Alps in Austria were analysed. The pebbles are classified into six groups: 1) Triassic carbonates (uppermost Werfen to basal Gutenstein Formations), 2) Upper Jurassic to lowermost Cretaceous carbonates (Oberalm Formation and Barmstein Limestone), 3) contemporaneous carbonate bioclasts (?Valanginian to ?Hauterivian), 4) siliceous pebbles (radiolarites, ophicalcites, siliceous deep-sea clays, cherts), 5) volcanic and ophiolitic rock fragments and 6) siliciclastics such as quartz-sandstones and siltstones. The radiolarites show three age groups: Ladinian to Early Carnian, Late Carnian/Norian and Late Bajocian to Callovian. The Middle Triassic radiolarites are interpreted as derived from the Meliata facies zone or from the Neotethys ocean floor, whereas the Late Triassic radiolarites give evidence of the sedimentary cover of the Neotethys ocean floor. During late Early to early Late Jurassic, the Triassic to Early/Middle Jurassic passive margin of the Neotethys attained a lower plate position and became obducted by the accreted ocean floor of the Neotethys Ocean. The accreted ocean floor was contemporaneously eroded and resedimented in different deep-water basins in front of the nappe-stack. These basin fills were subsequently incorporated in the orogen forming mélanges in this complex ophiolitic nappe-stack. The Middle Jurassic radiolarites are interpreted as the matrix of these mélanges. Together with the volcanic and ophiolitic material the siliceous rocks were eroded from this ophiolitic nappe-stack in Early Creta- ceous times and brought by a fluvial system to the Rossfeld Basin within the Tirolic realm of the Northern Calcareous Alps. The different fining-upward sequences in the succession of the Lower Cretaceous Rossfeld Formation can be best explained by sea-level fluctuations and decreasing tectonic activity in the Jurassic orogen. Abstract: A small group of Tithonian planktonic ciliates, little-known in the area of the Polish Outer Carpathians, has been recorded in exotic limestones from the western part of the Silesian Nappe. Eleven species of the family Chitinoidellidae Trejo, 1975, belonging to the genera Chitinoidella, Daciella, Dobeniella, Longicollaria and Popiella are described here. The majority of studied samples have been assigned to the Boneti Subzone of the Chitinoidella Zone. Exotics with chitinoidellids represent environments which can be interpreted as platform margin reefs, slope of platform and inner platform. Abstract: The stratigraphic position of the Goryczkowiec Sandstone reflects the Paleocene ridge geodynamics in the Outer Carpathian basins. The Goryczkowiec Sandstone was deposited on the slope of a ridge, known as the Subsilesian Sedimentary Area that originated during reorganization of the Outer Carpathian realm. A Paleocene age of this sand- stone, documented clearly by autochthonous foraminiferal and algal assemblages indicates the time of the final forma- tion of the Subsilesian Ridge. Abundant calcareous material of biogenic origin was transported by turbidity currents into deeper zones. This material includes fragments of carbonate buildups represented by algae, bryozoans and other organisms growing in the shallower part of the ridge. 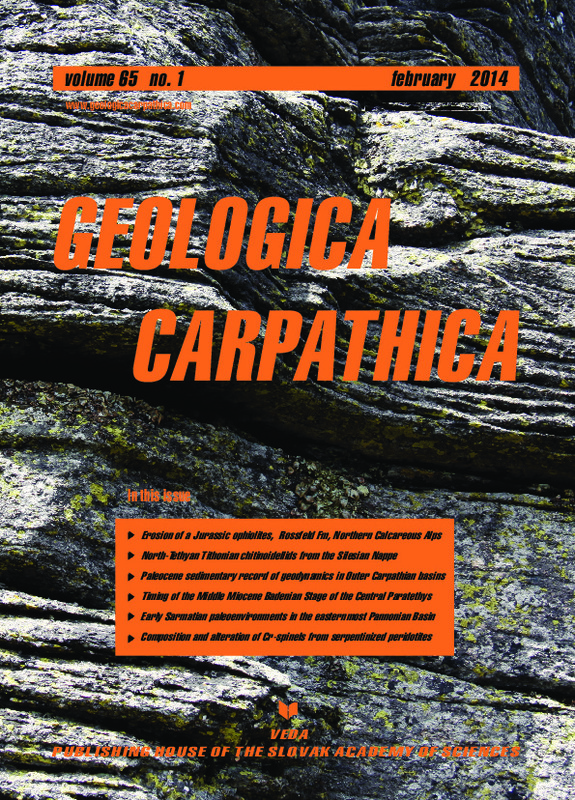 The Goryczkowiec Sandstone, previously known as the Szydłowiec Sandstone, is here redefined as a new lithostratigraphic unit within the Subsilesian Sedimentary Area in the marginal Outer Carpathians in Poland. The new name clarifies the ambivalence in the lithostratigraphic nomenclature. Abstract: The Sarmatian sedimentary record of the Borod Depression (eastern Pannonian Basin) consists of a marine sequence with continental influence. The investigated section, located near Vârciorog, was biostratigraphically and paleoenvironmentally analysed. The micro- and macrofossil assemblages include dasycladaceans, characeans, foramin- ifera, molluscs, polychaetes, ostracods, crabs, bryozoans, fish and vertebrate remains, which are characteristic for a shallow marine setting with local transitions to continental facies. The microfossil assemblages are characteristic for the Elphidium reginum Zone and Mohrensternia Zone of the early Sarmatian (Serravallian). The succession of popula- tions correlates with the sedimentological trend, allowing the separation of several genetic units. The relative sea-level changes and the progradational trend from the top of the section suggest active tectonics in the hinterland (Apuseni Mountains). The shallow seas surrounding the emerging islands (Apuseni Mountains) provided the connections be- tween the Pannonian and Transylvanian basins during the early Sarmatian. Abstract: The Pindos Ophiolite rocks include variably serpentinized peridotites derived from a harzburgitic and subor- dinately dunitic mantle. In the serpentinized matrix of these rocks pseudomorphic (mesh, bastite) and non-pseudomor- phic (interpenetrating, type-2 hourglass) textures were recognized. Chromian spinel (Cr-spinel) is anhedral to subhedral and often replaced by a porous opaque phase. Chemistry data show that Cr-spinel cores retain their original composi- tion, having Cr#[Cr/(Cr + Al)] that ranges between 0.45 and 0.73, and Mg#[Mg/(Mg + Fe2+)] that varies between 0.52 and 0.65, accompanied by low content in TiO2 (< 0.11 wt. %). The relatively wide variation of their Cr# values reflects that the studied peridotites were produced by variable degrees of melting. It is likely that the Pindos peridotites repre- sent mantle residues originally formed in a mid-ocean ridge (MOR) environment, which were subsequently entrapped as part of a mantle wedge above a supra-subduction zone (SSZ) regime. Cr-spinel adjacent to clinochlore systematically displays limited compositional and textural zoning along grain boundaries and fractures. However, the degree of peri- dotite serpentinization does not correlate with the abundance of zoning effects in accessory Cr-spinel. Thus, Cr-spinel zoning is thought to represent a secondary feature obtained during the metamorphic evolution of the host peridotites. Core to rim compositional trends are expressed by MgO and Al2O3 impoverishment, mainly compensated by Cr2O3 and FeO increases. Such chemical trends are produced as a result of Cr-spinel re-equilibration with the surrounding serpen- tine, and their subsequent replacement by ferrian (Fe3+-rich) chromite and clinochlore, respectively, during a brief, fluid assisted, greenschist facies metamorphism episode (T > 300 °C). The limited occurrence of ferrian chromite with high Fe3+# values suggests that elevated oxidizing conditions were prevalent only on a local scale during Cr-spinel alteration.